Need a quick boredom buster that will keep the kids entertained for a good long while? 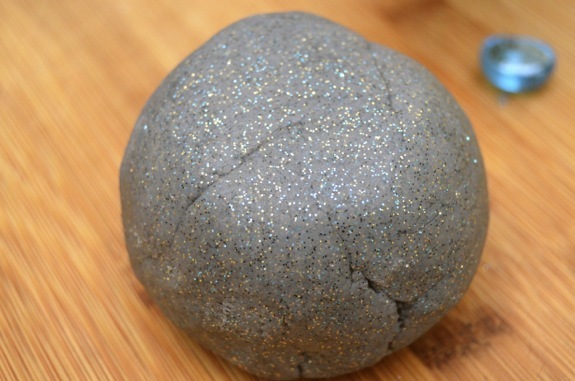 Try making a batch of homemade grape scented play dough, then add some glitter for “galaxy dough”!! Clara adores anything shiny and sparkly, so this was a HUGE hit for her! I hardly ever use glitter in crafts (it gets EVERYWHERE), but this was a fantastic way to contain the glitter mess. She was thrilled!! This play dough kept her entertained for HOURS! I thought I would share the recipe here with you, in case you’d like to make some of your own too. Combine water, salt, cream of tartar, and packet of drink mix in a medium saucepan. Cook on low heat while stirring, and add the oil. Next, slowly add in the flour a little at a time. Keep stirring until it starts to pull away from the pan, then transfer to a cutting board to cool. As soon as it is cool enough to touch, begin kneading the dough. It will become a lovely play dough consistency with a grape scent to it, and then it’s time to knead in the glitter!! 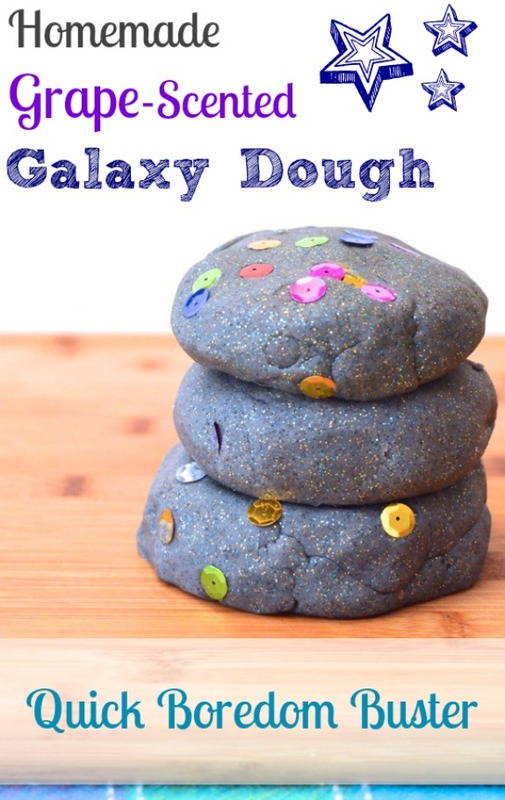 We used plenty of gold, black, and blue glitter to make our galaxy dough, but you can use whatever colors you’d like. 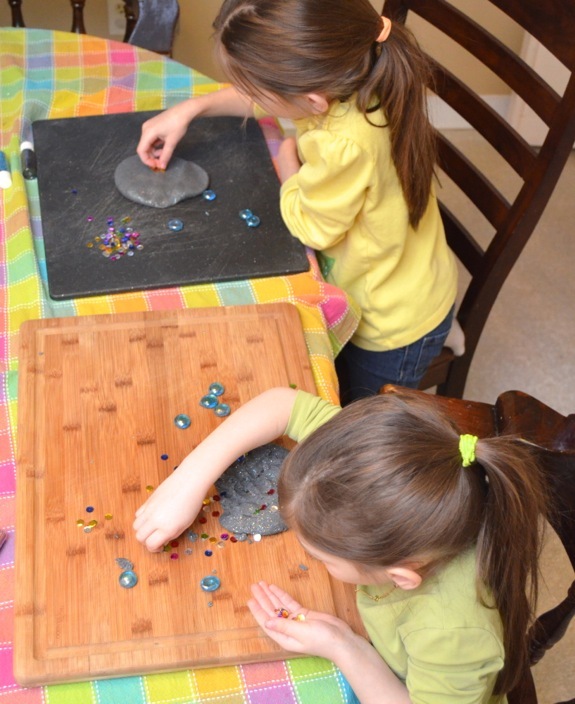 The girls loved adding glass gems and sequins to their galaxy dough to make stars and constellations! Leftover galaxy dough can be saved in zip topped bags for several weeks and played with again and again! I was impressed — the glitter really does stick in the play dough and I won’t be finding it in my hair for weeks. 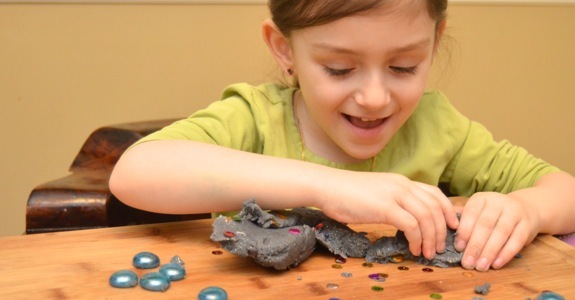 Apparently all of my glitter woes could have been cured with play dough! I know what you mean. I kept thinking there’s a reason Demetri Martin refers to glitter as the “herpes of all craft supplies”. Honestly, I’m pretty sure this is the first time EVER I’ve crafted the stuff and won’t be finding it EVERYWHERE for weeks! My son saw me looking on Pinterest today and told me that he wanted to try this play dough. I luckily had grape kool-aid in the pantry and we made it right away. He loved adding the glitter. He had fun making planets and decorating it with star beads. Thank you for the quick idea today. It gave me a peaceful hour of play! HA!! I can’t believe someone else knows about that Demitri joke! That’s awesome! Can I make this without the grape drink mix? Or do I have to use more of any of the other ingrediënts in this case? By the way; love the Demitri joke! My Daughter Is Gluten Free. Do You Know What I Can Use Instead Of Flour?